When my son was a toddler, I questioned whether he'd ever become familiar with the fairly tales I grew up with. I didn't hear them being taught in his preschool, and the books I used as a teacher were packed away. But that didn't last very long because fairy tales are referenced everywhere. In television shows, movies, and books. Of course, nowadays, more PC versions are available, and that doesn't surprise me. Because let's face it- there's lots of meanies, death, despair, and wolves in fairy tales. So recently, I went to my teacher box and pulled out the books I loved. The books that take traditional fairy tales and mashes them up. Like, THE TRUE STORY OF THE THREE LITTLE PIGS. In this book, the Big Bad Wolf (who asks to be called Al) recounts his version of what really happened in the story of The Three Little Pigs. I admit it's for kids six years and older. My little guy was amused and said the wolf must be lying! If geese had graves, Mother Goose would be rolling in hers. 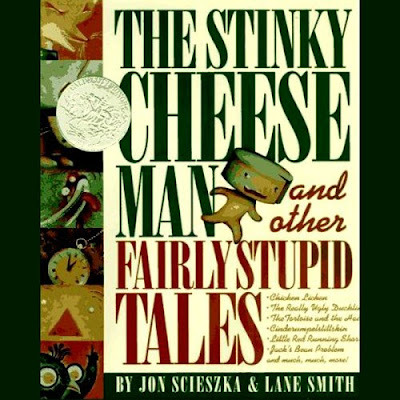 The Stinky Cheese Man and Other Fairly Stupid Tales retells--and wreaks havoc on--the allegories we all thought we knew by heart. In these irreverent variations on well-known themes, the ugly duckling grows up to be an ugly duck, and the princess who kisses the frog wins only a mouthful of amphibian slime. 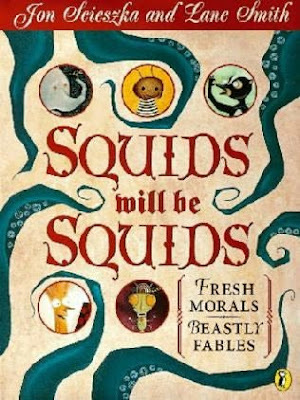 And last (but not least), is Scieszka's SQUIDS WILL BE SQUIDS. In this one, Jon makes up his own fables, and they are HYSTERICAL. SKUNK, MUSK OX AND CABBAGE were sitting on the porch at Skunk's house. Slowly but surely, the porch filled with a terrible smell. "Whoa!" said Skunk. "Is that you, Musk Ox?" Musk Ox shook his shaggy head. "No way, Skunk. That's Cabbage." "UH uh," Said Cabbage. "That's not me." Musk Ox and Cabbage looked back at Skunk, who suddenly became very interested in tying his shoe. MORAL OF THE STORY: HE WHO SMELT IT, DEALT IT! So here's to you, Jon Scieszka! Keep bringing it! Love these!!! OH and The Stinky Cheese Man... oh the memories!!! Ohmygosh, he was one of my favourite childhood authors! In third grade, we did a project on The True Story of the 3 Little Pigs. I had no idea that Jon wrote it, though! Oh my gosh. These look so familiar. Does he have a frog prince one? Jon Scieszka is speaking at the upcoming SCBWI LA conference. Great, fun stories! For me, these kinds of books are the reason why it IS important to read and teach kids the basic fairytale stories, so they can appreciate twisted versions or references to them in movies, TV, games, etc. I love stuff like this, sounds hilarious! I love retellings of fairytales. S&S has a line of YA novels that I was sucked into at one point. They were a twist on the original versions, so you didn't know what to expect. Brilliant. There is a good lesson there. Too funny. I've read the three little pigs one (fantastic!) but not the other two. I'll have to check them out! I am bad. Never heard of any of these. But that last one...BHAHAHA. What would I do without you??? Yep. He's great. So funny. I loved The True Story... So cute. I read to a classroom a few years ago and there was another take. I think it is called The Three Little Havelina. Pretty cute too. I just love him, but I don't have the Squid one yet. I have the other two and they've been read over and over and over. I've enjoyed Jon Scieszka's twists on fairytales too. And you're right, fairytales are referenced everywhere. I'm not familiar with this author but he sounds much like Saki, who wrote children's stories that children loved because they dealt with the bad guys in a great way. Come visit when you can. P.S. How's the big coming along? Definitely need to re-acquaint myself with these stories. I love mashed up fairytales!